We have been trying to go to the pool twice a week to keep the kids cool and happy. I had been wanting to make a swimsuit cover-up ever since seeing all of these, but didn’t have the time until yesterday. It was pretty easy to make. I used two thrifted t shirts and my regular sewing machine. It only cost me $1, free if I had been able to find two decent t shirts in the hubby’s closet. 2 mens t shirts. Find one that fits loosely. You will need the extra size for the gathered neck. 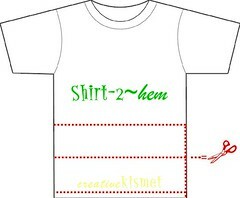 The second t shirt will provide material for the ruffled hem. 1. 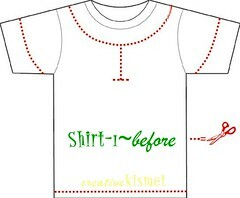 Cut Shirt~1 along the red dotted line, as seen in the diagram above. Save the hemmed piece from the shirt for the drawstring (see #6). 2. Cut second shirt as seen above for ruffled hem. I cut my hem 5.5 inches wide, but this can be modified to any width. 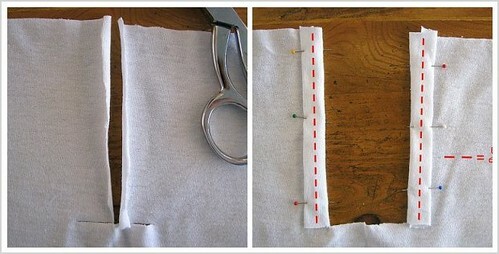 With the 2 cut strips, sew short ends together to make one very long continuous strip. Sew straight stitch (using longest stitch) across the top of the entire length of the strip. Pull bobbin thread to create a light gather. Set aside. 3. Sew neck pleat on shirt ~1. I used a scrap piece of fabric to demonstrate this part. Turn shirt right side in and double fold in edge of plunged neckline (as seen in photot). Pin in place. Using a zig-zag stitch (straight stitch would probably work, but it’s not as pretty) sew straight down on doth sides (see the red dash line). 4. Turn shirt right side out again and bring sewn edges together to make a pleat. Pin in place and sew. 5. 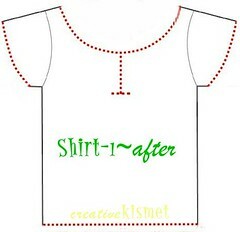 Make casing around neckline. Fold in 1/2 inch all around neck and sew using straight stitch. 6. 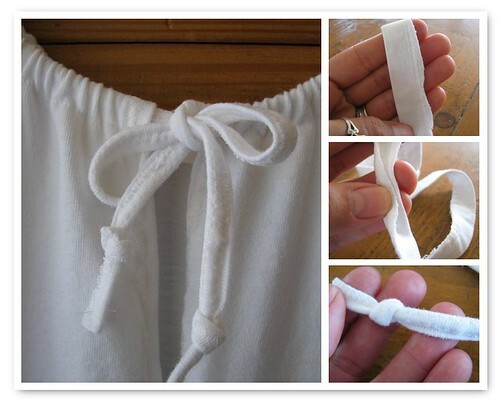 Make drawstring using leftover hem from shirt. 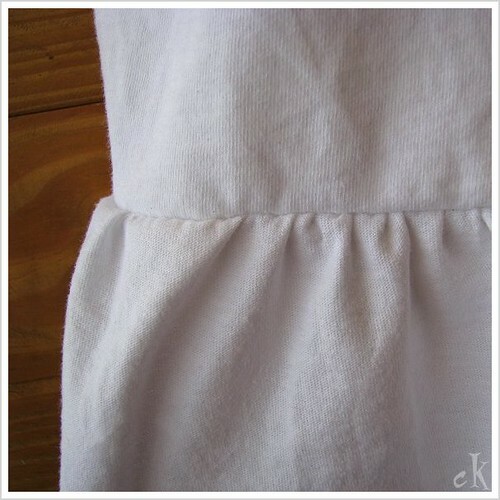 Fold hem in half lengthwise and zig-zag stitch all the way across the length. Tie one end in knot. Attach safety pin to other end and work through neck casing. When all the way through, tie knot on the end. Adjust gathers evenly. 7. Sew on ruffled hem. You might have to mess with the gather to achieve the correct length for sewing on. Plus, you may want more or less of a ruffle than I have. My long strip was 1/3 longer than the total width of my shirt bottom, if that helps any. Once you get the gather you like, cut off any excess and sew short ends together. 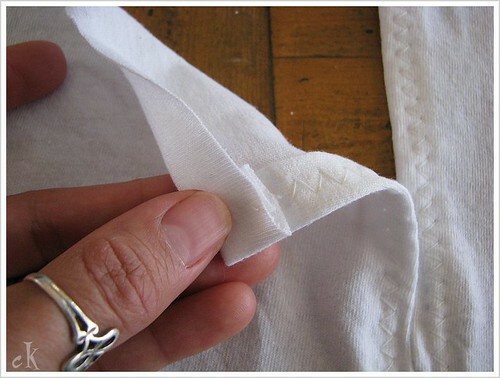 Sew onto shirt by pinning right sides together and then zig-zag stitch all the way around. 8. You’re done!! Go get on your swimsuit (as fun as that sounds), slip on this cute dress and head to the pool (or even better–the beach!). This is a very flattering dress, especially for those like me, with those empty-baby-house curves. * A serger could definitely be used for this but is not needed. *When using a regular sewing machine, try not to stretch fabric as you sew. Practice on some scrap fabric and make sure your tension and feed dogs are adjusted as needed. * A straight stitch works well for any area that will not be stretched, otherwise use a zig-zag stitch to allow for a teeny bit of stretch. * No hem is needed for the sleeves and ruffled hem edge – it’s knit! It can handle that. * This would be a cute dress too. Try 2 colorful t shirts instead. I hope this all makes sense. Let me know if you have any question. This entry was posted in Clothing, Recycle,Reduce,Reuse, Sewing, Tutorials, how to and tagged Clothing, DIY, dress, how to, makeover, refashion, Refashions, Sewing, swimsuit cover-up, t shirt, t shirt makeover, t shirt refashion, tutorial, Tutorials, how to. Bookmark the permalink. You are so smart. Wish I could figure out something like that. Wow! Off to make one asap! This is too cute! Cute! You did a great job. I love making something into something else. This is brilliant – I’m going to go scrounge in my husband’s closet right now! I can see you have a very geometrical mind! Only people like you can see the possiblities on a white simple t-shirt. Congrats! Ooh, fun project! I’m always looking for cool collar modifications for my boxy t-shirts. I may try this on a regular shirt… or I may make a dress! Thanks so much for sharing! It’s a great project, thank to for share it. Cute idea! I think I’ll try this for a nightgown. I have an old shirt that will be perfect for this project! And thank you for stopping by my blog. I look forward to visiting your again soon. That’s darling! I love it, I’ll be linking. So nice of you to share your good ideas. Using a smaller t-shirt, this would make a cute refashion for a child. My granddaughters would love it! I love your idea! I’ve been trying to figure out a way to make a neck cuter on a regular t-shirt! I can’t wait to try this! I made this today as a dress. I used something different for the ruffle. Very cute and it only took me 20min!!! Awesome idea. I made this today with an old T-shirt that I don’t wear anymore, it looks great and was easy to make, I may try more for my girls later, if they like this one. I was looking for a cover up that I could make with my old t-shirts, I have so many I don’t wear anymore. So cute! I love the neckline & the ruffled hem & as several others have commented, it doesn’t necessarily need to be a cover-up. Thank you for posting this. I saw it in Craft Magazine & had to stop by for a look. Gorgeous! Only the top shows in the first picture though. Even tried reloading it. Oh-I love this coverup. I looks so easy to do too! Thank you for sharing this project, your instructions and pictures are great and easy to follow. Thank you for the idea! I was looking for a cover up for our beach trip. I went to A C Moore and bought pink t-shirts to try out for just $5 for 2. Can’t wait to try this out! I just made this today: I was so excited about it and it is so cute. One question though, when I tried it on, the sleeves hung really big and open in the back (and wasn’t very flattering). Did this happen to anyone else? I can’t wait to try variations. Thanks for the guide! Merci beaucoup pour ce superbe tuto! I love this! Of all the t-shirt reconstructions I’ve seen, THIS is the most wearable and stylish. Great job ! Oh my goodness! thank you for showing that. Just seeing your photos of the cute neckline and something I have been struggling with for years became crystal clear. 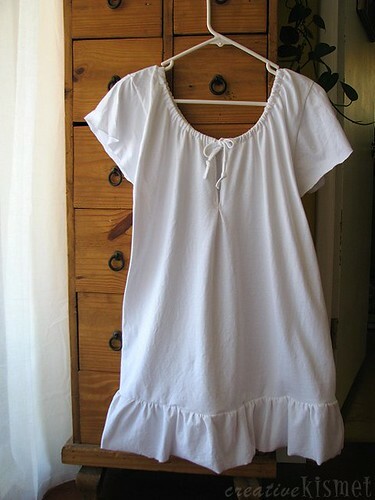 Great tute – just made one for myself with an old white concert tshirt and red ruffle & drawstring. Wearing it now around the house with shorts – very cute! This is great, I like the mod. I have been modifying my shirts for years. I really like to add my own touch to the sleeves. Everyone asks where did you get that shirt. I’m making one today! I’m making the plunged neckline a bit lower so it’ll be easy for breastfeeding my baby this summer – pool or not! Oh, and as cute as white is, I got darker t-shirts for better coverage when wet. 🙂 Thanks for the tutorial!